We utilize many instruments and specialized equipment to help evaluate your eye health and treat your eye conditions. Some of these instruments are used for routine eye exams, and others are for analysis of specific eye health conditions. This page will give you an idea of what to expect from each instrument and some of the reasoning behind their use. This instrument automatically measures an objective refraction, or theoretical refraction of what lens powers you should need to see good in the distance. You just look into the instrument where you see a picture. The instrument looks to see where light focuses on the back of your eye, and what lenses it would take to make the image focus in the right area. It measures sphere, cylinder and axis for each eye, as well as radius of curvatures and axis for the cornea of each eye. These measurements will give us a good idea if you have a change in your prescription, or a starting point to determine the ideal prescription for you. The auto-refractor can be an invaluable tool for children and other patients whose responses are not reliable. The Zeiss Humphrey Corneal Topograhper creates a mapping of the front cornea surface of you eye. It is helpful in fitting and evaluation of contact lenses, diagnosing corneal disease, irregular astigmatism and keratoconus, and is necessary for laser vision correction evaluation and follow-up care. We include corneal topography in all of our contact lens fitting services, and post-laser vision correction eye exams. You look in the center of the rings at a red light, the rings reflect off of the tears of the cornea surface of your eye while an image is taken and converted to topographical data. This data is plotted on a map where it can be analyzed in a number of ways depending on our specific needs. The Zeiss Cirrus HD-OCT is a laser scanning instrument that scans the eye with light and allows for evaluation of layers of the retina, macula, cornea, or optic nerve. This instrument is particularly useful for those patients whose vision cannot be corrected as well as previously possible, and for glaucoma patients and evaluation. An analysis of the retina can evaluate macular thickness, wet or dry macular degeneration, separations, holes, hemorrhages, or raised areas of the macula and retina. In glaucoma patients or suspects, we will analyze the optic nerve area. We can measure nerve fiber thickness all around the optic nerve, and map in 3 dimensions the optic disc area. We watch for changes over time in these areas. We can also measure the front corneal surface of the eye to determine adjustments needed to pressure measurements, or check for angle closure glaucoma conditions. In its simplest form, this is a specialized camera designed to take pictures of the back surfaces of your eye. We normally take photos of things we think might change, or an area that needs to be expanded for better observation or measurement. With digital software, we can add filters or change contrast to better observe what we need to see. For glaucoma patients or suspects, we will photograph the optic nerve area. Changes in the optic nerve may mean new treatment or a change of treatment is necessary. The camera can capture a large area of the retinal or macula in a high resolution format that can be studied for evaluation or documentation for future reference. Fundus photography can be particularly valuable for patients with drusen, diabetes, nevi, glaucoma, macular degeneration, vein or artery blockage, hemorrhages or retinal detachments. Many times, these photographs can be used to help our patients understand their condition. When you look in this instrument, you will see a green fixation light, then a flash when the photo is taken. One of three methods our office uses to measure intraocular pressure, the pressure inside your eyes. The only type of instrument that can measure pressure in your eye without touching it. This method of is done with a light puff of air. The Reichert Non-Contact Tonometer (NCT) measures the response of your eye to the puff. The response is calculated and converted into a measurement of pressure. You lean against the top with your forehead and look at the lights. The lights will align with your eye, come up close, and blow a light puff of air at your eye. We have the softest puff instrument available. The original method of intraocular pressure measurment and standard for decades. After an eye drop is put in to tint the tears and numb your eye surface, the doctor will touch the tonometer tip to your eye and measure the resistance of deflection of your eye. Our 3rd method of intraocular pressure measurement, the Tonopen is simply touched to an anesthetized eye surface to measure pressure. We use this method for patients with limited mobility or when the other methods are not practical. 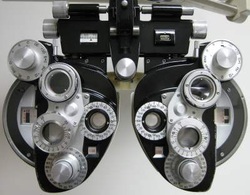 The device that makes optometrists famous for the question "one or two?" Refractors have thousands of lens combinations in them that allows the doctors determine what powers of lenses you like to look through for your best vision. You look through these lenses at a chart while the doctor asks which you like better, the first choice or second choice. By utilizing a trained sequence, our doctors can identify what combination of spherical, cylindrical, and prism lenses are preferred by you. The slit lamp is a combination of a horizontal microscope combined with a high intensity light. We use the slit lamp to look at the different parts of your eyes. By varying the power of the microscope and the color and intensity of the lighting, the doctor will inspect your eyes from front to back. 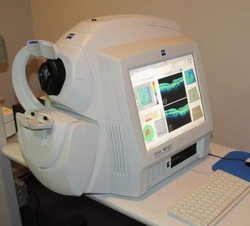 The Zeiss Humphrey Visual Field Analyzer is also known as a peripheral or side vision test. We use this instrument for glaucoma patients and suspects, patients having headaches, visual disturbances, decreased vision, blind spots, and some systemic conditions. When taking this test, you will watch a fixation light in the back of the instrument. The instrument will then flash other lights around the center light. When you see another light flashed, you will push a button to let the analyzer know you see the light. The instrument is calibrated for your age and will vary the intensity of the lights to enable us to evaluate any changes to the sensitivity of different parts of your retina. The Corneal Pachometer measures the thickness of the cornea of your eye. We use pachymetry for laser vision evaluation, and to determine correction factors for pressure measurements. Tonometers for measuring pressure are calibrated for average corneal thicknesses. By measuring your actual corneal thicknesses, we can convert measured pressures to more actual pressures. Accurate pressure measurements are most critical for glaucoma suspects and patients. This instrument is used to measure the central 3 mm of curvature of your cornea. While we have other instruments that measure your cornea as well, there are a couple of instances where this is the best instrument to use. Looking in this instrument, you will just see a big white circle outside, with 4 white dots surrounding a reflection of your own eye. 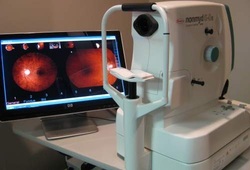 We simply focus the instrument on your eye and take readings off the dials.